You are here: Home » Open Doors: Integration and the Impact of Refugee Populations. Most of my work has started with research and then developed into film or photography through a situated approach that allows me to really get to know my subjects and the contexts in which they live in this city. For this particular project, it all started through my involvement as a researcher on a project led by Will Monteith at the School of International Development at University of East Anglia and Shuaib Lwasa at the Urban Action Lab at Makerere University in Uganda. As a researcher, collecting data in the form of multiple interviews across the cities helped develop my perspective on refugee life in the city. I then looked into these collected stories from an artistic perspective. So when the opportunity for participating in the OPEN DOORS exhibition came along I did not hesitate to apply since I had already a good understanding about the refugee situation in the urban city of Kampala and was keen to develop an artistic response. My photographic investigation focused on Elvis, a 27 year old Congolese refugee who moved to Kampala from Bukavu Goma in Congo. 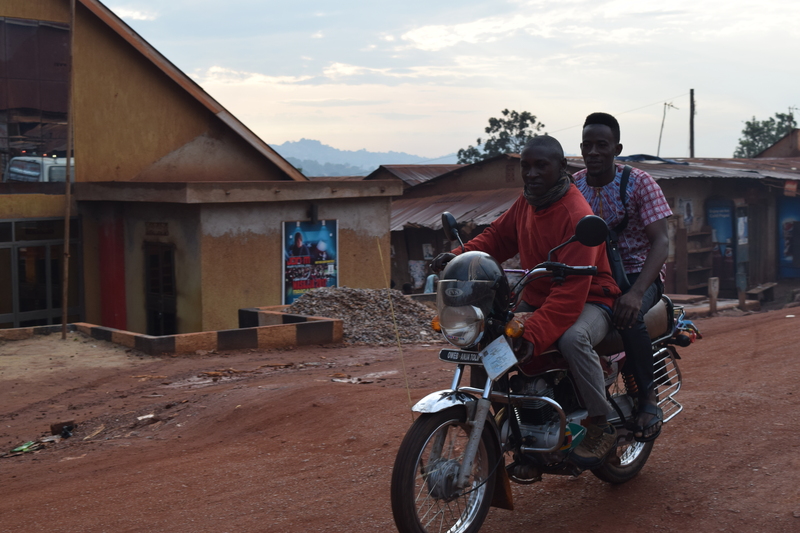 He told me, ”we came from Congo to Uganda in 2011, I remember one day when we were in our village, the soldiers came and attacked our home and my dad decided to move us from Bukavu to Goma then we got a bus to the border of Congo and Uganda. We first lived in Kisoro for one month that time my dad went to Kampala and left us there he wanted to first find a place then he bring us”. When his family arrived in Kampala they settled at a Church in Katwe before they could find where to stay. This is a common practice by most of the refugees from Congo, the church in Katwe is a Congolese founded church and that is the reason to why they first settle there before going getting where they can settle in the city. Later when they resettled, Elvis together with his family started to look for jobs in the city, but it was something very hard for them to find. 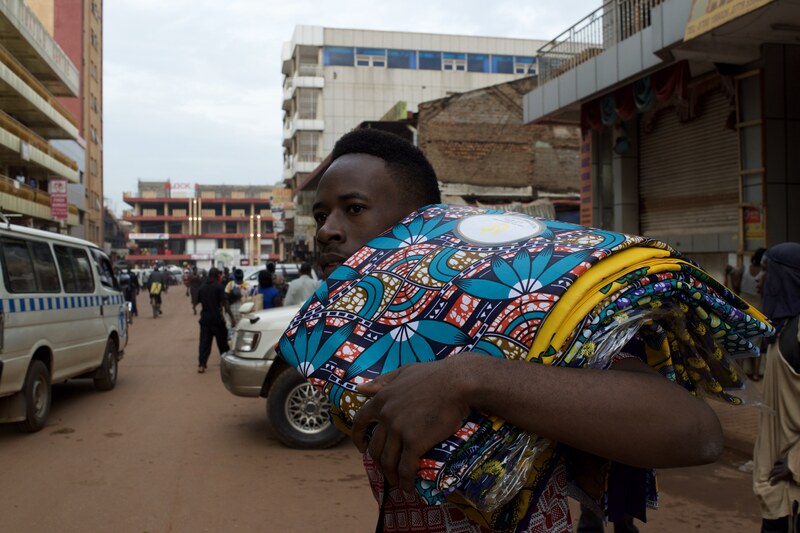 His mother got a job at a local restaurant where she worked for some time and later joined the Kitenge (Fabrics) business with a help from one of her friends who was already in the kitenge business. She started as a hawker where she asked Elvis to help her to work together. 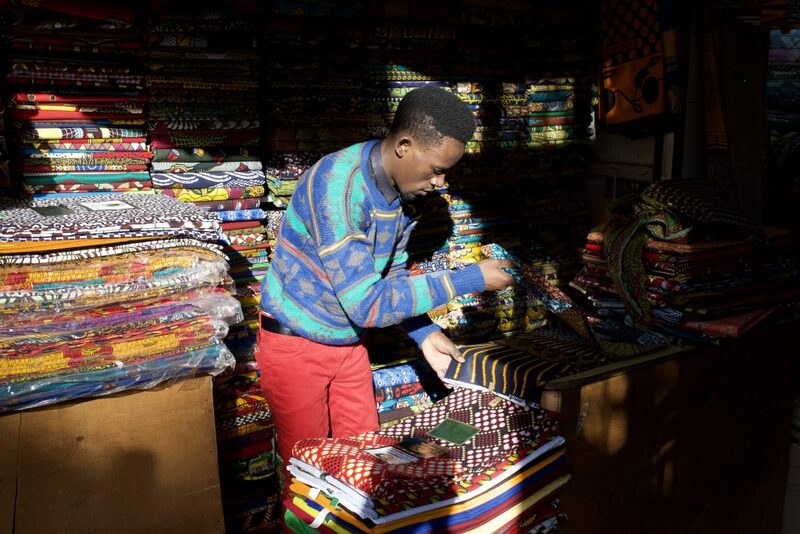 A few years later when Kitenge became a big thing in Kampala and in the international market, they got established and got spaces to sell from in downtown Kampala. 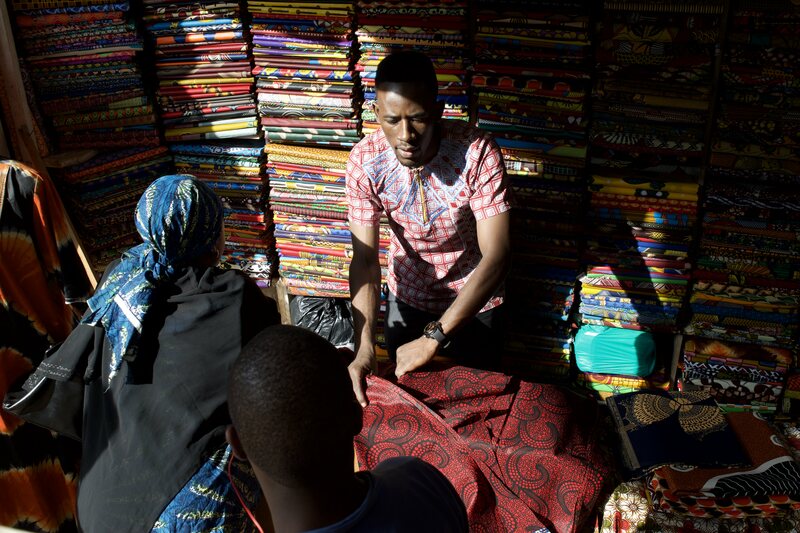 Now Elvis sells Kitenge from Zaina Plaza, a center of fabrics in downtown Kampala. Elvis spends most of his time at work. He leaves his home every day at 6:30am in the morning to go to town to work and closes at 7:30 PM everyday. 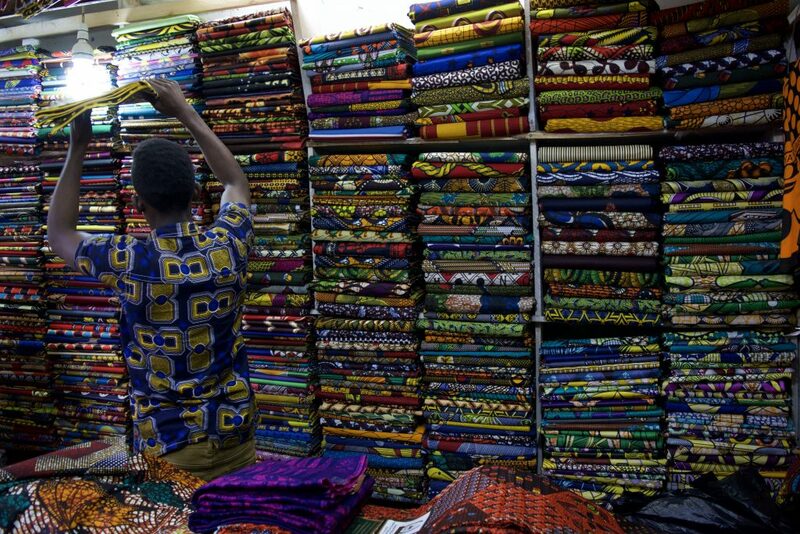 He spends the whole day behind his counter selling fabrics to the customers. 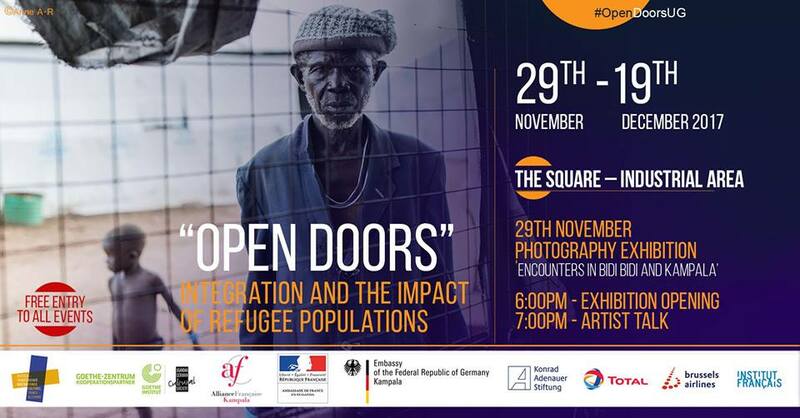 This exhibition compares the situation of refugees in Uganda, Germany and France and the respective country’s policy of asylum and reception of refugees through public dialogue, talks, film and photography. The project idea was sparked by the harsh contrast of policies in Germany and France compared to Uganda. Even though the “refugee crisis” and the way it has been handled in France and Germany has been at the heart of international media, the number of refugees received in the two European countries is very low in comparison with Uganda. With a population of about 40 million people, Uganda is the 3rd largest refugee hosting country in the world and is known for its progressive and visionary character of handling the large influx of displaced people from neighboring countries and others such as Burundi and Somalia. The exhibition brings together experiences of displacement in rural refugee settlements with experiences of the city as a place of refuge within Uganda. It sheds light on single stories that, brought into context with each other, can as well give insights into the highly complex situation of refugee populations in Uganda. Presented through the eyes of the photographer, the viewer experiences personal stories of human encounters – moments of exchange between the photographers and the individuals from Bidibidi and Kampala. As diverse as the life realities of refugees in Uganda, these encounters tell stories that take place at the edge of despair and hope, of survival and new beginnings, as well as of immense creative and entrepreneurial energy. In preparation of the exhibition, the French photographer Anne A-R was invited to Uganda to facilitate a workshop for four young Ugandan photographers in the refugee settlement of Bidibidi in Northern Uganda. While being a workshop facilitator, Anne as well created her own photographic series in Bidibidi. Meanwhile, Frank Schinski, photographer from Germany and part of the collective “Ostkreuz”, held a workshop in Kampala for another group of four upcoming Ugandan professionals. This group worked on the theme of urban refugee communities. Each group was working under the extreme conditions of becoming familiar with new approaches of visual storytelling through the medium of photography within a limited time frame. In an intensive phase of workshops and individual mentorship together with Anne A-R, the results from the field trips to Bidibidi and Kampala were reviewed and edited. The exhibition thus bears not only an exchange between photographer and photographic subject, but is also the outcome of an exchange between photographers from three different countries. The exchange of expertise, ideas and different approaches was therefore an integral part of this project (A collaborative project between Alliance Française Kampala, Goethe-Zentrum Kampala UGCS and Konrad-Adenauer-Stiftung Uganda & South Sudan).